Spokane’s utilities department has agreed to pay for the new orange bridge linking the area outside the Looff Carrousel to Havermale Island in Riverfront Park, a transfer that will cost future city water bill payers $6.6 million. Transferring ownership of the bridge from the park department to the utilities department gives the city $6.6 million more to make improvements in its current renovation of Riverfront Park, which has been plagued by unforeseen costs. But the proposal also raises questions about why utility customers should pay for the full cost of a bridge. Utility money from ratepayers usually is only used for sewer and water infrastructure – like water or sewer lines under a bridge. Indeed, the utility department originally only planned to put $200,000 toward the bridge, an amount to cover the pipes that carry water for the city. City officials say buying the bridge won’t result in higher utility bills, because it has already borrowed the money to pay for it from bonds for an array of utility projects. The parks department plans to use the money from utilities to “enhance” other areas of the park, including a regional playground planned for the park’s north bank, as well as add amenities to the under-construction U.S. Pavilion, park officials say, and not complete marquee projects that were approved by voters in 2014. Utilities officials say they are reimbursing parks for the entire cost because the city has moved away from replacing one of the other Howard Street spans, known as “the Blue Bridge,” north of the bridge that was rebuilt. There had been a previous commitment to pay for the Blue Bridge replacement. Howard Street used to run through the land that became Riverfront Park on three bridges. The southern bridge was rebuilt in the last year. The agreement is one of several made between parks and utilities that have in part increased the full scope of work in the park to $71.3 million, according to the latest budget documents the parks department has prepared on the development. Voters approved the sale of $64 million in bonds for work in the park, which had not received a significant upgrade since the years following Expo ’74. Utilities had been in discussion for several years to replace one of the Howard Street bridges during the reconstruction of the park, said Rick Romero, who headed that department until 2016 and has been working at City Hall on other special projects, including the park’s redevelopment. A water main runs along the two bridges which has needed to be increased in size, regardless of the work in the park, he said. “Without those bridges, we have no way to move our sewer and water,” Romero said. The Post Street Bridge, also slated for replacement in the coming years, will include utilities money due to a large sewer main that runs beneath the deck. Still, a previous agreement, signed in January 2016, for the utilities department to pay for replacing the Blue Bridge that links Havermale with the the island that is the Salish name for “Salmon People” didn’t include a final dollar figure, only that there would be “an interdepartmental agreement between Parks and Utilities about the project.” A revised structural analysis of the Blue Bridge determined it didn’t need to be replaced as previously thought, so the two departments decided essentially to “swap bridges,” Romero said. The city had included $5.4 million to cover the costs of a bridge replacement in its long-term construction plans. Marlene Feist, strategic development director for the public works division, said the payment continued the city’s practice of integrating costs for street and utility work, noting that public works is using a lot of park and green space throughout the city for some of its stormwater projects. “It frees up a little budget room, and that’s a good outcome for citizens,” Feist said. The money for the project has been earmarked out of the sale of so-called “green bonds” totaling $200 million that are intended for use on water and stormwater projects, she said. Those won’t be paid off until 2034, with interest payments expected to reach $70 million by that time, according to the city’s most recent financial statements. Funding for capital projects come from a variety of sources, Feist said, meaning some of the money that is paid back to the park fund may not come from the sale of the green bonds. Any money that is used out of that fund for the bridge reimbursement would not be available for other stormwater and sewer projects, including the large stormwater tanks being buried around town. The green bonds will be paid back using the revenue generated from utility rates. Rate increases have been capped at 2.9 percent annually through 2020, tied to inflationary figures calculated by City Hall. Parks Director Leroy Eadie said the discussions started when the city received the hefty potential price tags for replacing the bridges, which weren’t completely known when leaders asked voters to approve a different bond sale to pay for the park redevelopment. 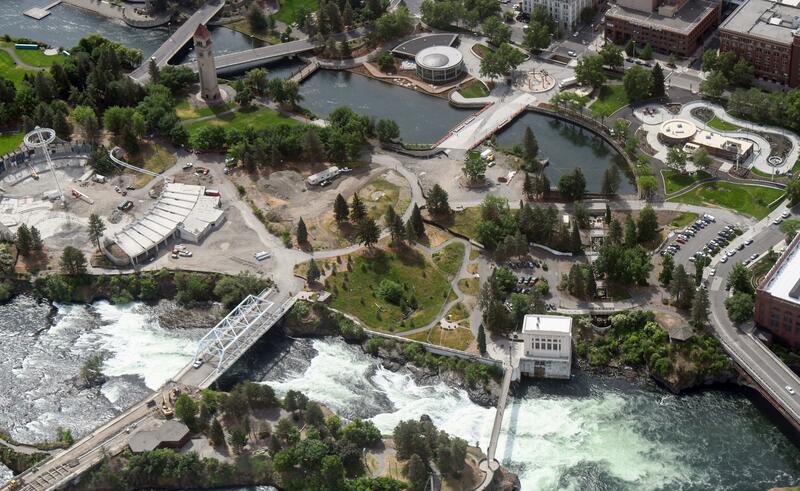 The transfer has not yet included approval from the Spokane City Council, though Council President Ben Stuckart and Councilwoman Lori Kinnear have been included in discussions about the bridge plans as part of an executive team overseeing the park’s redevelopment. They were added to the committee after Stuckart voiced concerns last summer about the design of the U.S. Pavilion and floated the idea of changing the Spokane Park Board’s authority. Stuckart said he stood behind the decision to use utility dollars for the bridge. “I think it shows that we’re leveraging different money sources to get the most out of the park,” Stuckart said. The City Council has scheduled a discussion of the issue during a committee meeting later this month, and the money has not yet changed hands. Former City Councilman Mike Allen, who also served as the council’s liasion on the park board, said he’d been skeptical of some of the agreements between the two departments that required payments from the utilities to parks. The park board will consider a plan on how to spend the anticipated funds at its monthly meeting at 3:30 p.m. Thursday at City Hall. The projects that will be funded with the additional utility money are enhancements, Eadie said, and didn’t consider utility’s assistance with the project as a bailout to cover the costs of the massive redevelopment project. Those projects include parking on the north side of the park, a new maintenance facility and improvements, including stages and balconies, in the new U.S. Pavilion. The work is now in its third year and has drawn criticism from past park board members concerned about the cost for some of the improvements already completed. Published: July 12, 2018, 5 a.m.